A pool beside a marsh, just below a small stretch of rapids. Insects buzz in the air. In your pocket is a wooden box of flies we were given by the river keeper before we left Myhrbodarna this morning. In front of you are private waters that are only visited a few times each year. As you are tying a fly, a golden eagle glides through the sky in the distance. Enjoy the magnificence as you make the first cast of the evening. 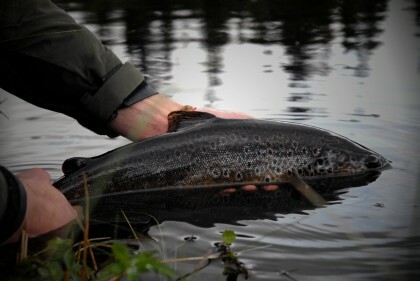 WILDERNESS FISHING IN HOTAGEN In the heart of Scandinavia we find the Jemtlandic Hotagsfjällen. Our guide leads you throug the spectacular nature to the fine fishing waters. To get there we hike. To stay there we live in tents or cabins.